Rituals and games. Matzah and maror. Passover is the most celebrated holiday in the Jewish year. It commemorates the 3,500-year-old Exodus – the story of how the Hebrew slaves in Egypt finally escaped to freedom. During Passover, Jews gather with family and friends for long, lavish meals called seders. At the seder, the story of the Exodus is re-created and reenacted by young and old alike through rituals, prayers, songs, and games. Readers will learn that during Passover, Jews eat special foods. The unleavened bread called matzah is a reminder that when the slaves hurried out of Egypt they had no time to let their bread rise. Bitter herbs called Maror symbolize the hard times the slaves endured in Egypt. But there are also delicious sweets to represent the sweet taste of freedom. 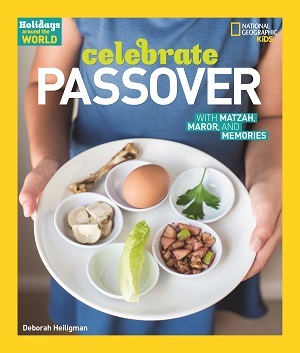 Read an interview by Cynthia Leitich Smith for Cynsations, about Celebrate Passover with Matzah, Maror, and Memories. It has been recognized as a 2008 Notable Book for Younger Readers by the Sydney Taylor Book Award Committee of the Association of Jewish Libraries.